Despite my best efforts at taking the usually pristine quality of their content down a notch the last time I did a commentary on the show, Living on Earth is airing yet another piece from me this week. You can listen to me lamenting the crappy-tasting-ness of processed junk food masquerating as something good for you in 'health' food supermarkets. You know what I am talking about, the 5-bucks-a-box cereals that taste like extruded cardboard. Yes. Those. Keep your ears out for my voice on Living on Earth, airing on NPR stations near you. Or you can go to LoE's website for this week's show to download a podcast of the entire thing, or just the piece from me. The transcript is also available. Who's reading the blogs now? "The Little Wine Bar That Could: Bin 8945"
"In West Hollywood, BIN 8945 Wine Bar and Bistro, which may be the most serious of the bunch, has opened near the corner of Santa Monica and Robertson boulevards. Think of it as the little wine bar that could.."
The place that made perhaps the biggest impression on me on this last trip to Europe –on yet another a pilgrimage to many starry restaurants- was, surprisingly, a kitchen without even a star to its name. This restaurant, called Etxebarri, which simply means 'new house' in Basque, was the very definition of the phrase 'middle of nowhere', and serves up the kind of strikingly personal cuisine that makes one sit up and take notice. A friend had warned us that the normally useful directions from Via Michelin were incorrect, and gave us instead a tattered treasure map with pencil markings on the roads where we were supposed to turn. We had a better idea though, or at least we thought we had one. We had a GPS in our rental car, whom we dubbed Hal II, and for whom we lavished blind faith. Need I say that our better idea turned out to be hardly better than nothing at all? Driving in and around San Sebastian is quite non-trivial. Many of the major arteries in and out of the main city overlap each other, with varyingly named motorways sharing the same actual road. Signs on the roadside look at times like a long series of coded messages. Adding insult to injury, everything is labeled in both Castellano (standard Spanish) and Euskara (Basque). Not that I would ever begrudge a people so proud of their heritage, but, speaking neither Basque nor Spanish, I found myself in a constant state of confusion in the world full of math equations in place of a road sign! After an action-filled drive from San Sebastian (ahem, Donostia), we finally made our way to a little town called Axpe, where Etxebarri locates. The restaurant is in an unbelievably beautiful setting, in a village seemingly comprised of only a few traditional stone buildings, set against a dramatic hillside. The picture doesn't do it justice at all. We came all the way here in seach of the distinct cuisine of the chef, Victor Arguinzoniz, the renown grill master of the region. To say that grilling is his passion would be an understatement. Not only that every dish out of his kitchen is grilled, but he makes his own charcoal, and even invented his own oven and grilling contraptions to take it to a whole other level. It's the kind of highly personalized cuisine that could be confounding to some. Michelin, who is unusually generous in this area –San Sebastian has the highest ratio of Michelin star per capita- gives him no star at all. I'm not sure if it was because they couldn't understand him, or perhaps simply couldn't find him. Chez Pim is featured in Food & Wine Magazine this month in a piece about food photography and blogs, with some useful How To tips and links to the 'best-shot' blogs, including this one. Frankly, not that I do humble very well, but I must admit -if just this once- that this particular accolade is perhaps more than a little undeserving. I take semi-random shots of food, and some of them happen to come out rather nice. But they are still amateurish at best. I think I'm just lucky that I've had some pretty interesting subjects to work on. There are food blogs out there with far better photographs than mine, professional quality even. Some of them were mentioned on the article, but there are some glaring omissions. If you are here from Food & Wine Magazine, let me point you to some food blogs with truly drool worthy photographs. Just make sure you don't go there hungry! Speaking of drool worthy, there's another blog I've just discovered, and it is perhaps the worthiest of them all. Ok, it's not even about food, but about something just as good, if not better, clothes. It's all about clothes, as meticulously and resplendently curated by someone who calls himself the Sartorialist. His photos of people and their fabulous fashion, on random street corners or at the most coveted shows in Paris or Milan, are so much fun to look at. And happily, he's a far more diligent blogger than I am, so he posts something new almost every day. The Sartorialist, je vous adore! Well, it's 2am over here on the West Coast. I'm off to bed. I'm leaving for New York in a few hours! The final round of the Cook-off at F&W Classic in Aspen pitted the ever hilarious José Andrés, helped out by Jamie-Lynn Sigler, against Ming Tsai and an audience member who won the bid to cook with Ming. For this round, I got over my reluctance to jump up and get close to take photos. Urged on by Jill, I was out there pushing my way in with the pack of real photographers. There was one photographer I willingly gave way to, though. She was from San Francisco’s 7x7 Magazine, and was there in the blue jeans, sneakers, and huge appareils pack with the others, but unlike them she was in miniskirt and a pair of high wedges. Now that got my respect! As José was happily ensconced in his corner with the gorgeous Jamie-Lynn Sigler, Ming put the position of his sous chef up for auction to benefit charity. Ming at one point offered up the key to his room as well, in an effort to drive the bids up. At least I think it was to drive it up(!) Alas, the highest bidder was a man, Robert Hatoff the owner of the meat company Allen Brothers. Alan turned out to be a perfectly competent, if a lot less cute, than José’s. This round was even more rebel rousing than the previous one. Ming’s bravado, José’s effusive-self, and their rapport combined had the audience in fits. I laughed so hard I had trouble stabilizing my camera. I have a scattering of stories to tell still from the Food & Wine Magazine Classic in Aspen a couple of weeks ago. 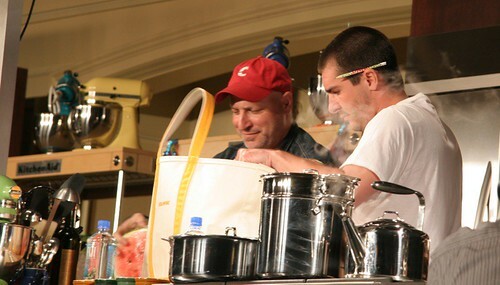 The most fun, of course, came from the final events, the two rounds Cook-off: the first between the Top Chef winner Harold Dieterle, aided by his ex-judge Tom Colicchio, against Jacques Pépin and his best friend Jean-Claude Szurdak, and the second between the ever hilarious José Andrés, helped out by Jamie-Lynn Sigler against Ming Tsai and an audience member willing to pay top dollar to charity for the honor of cooking next to Ming himself. The cook-off took place in a huge room, big stage, lights, massive production and all that jazz. The line formed early, and when the room opened every seat in that room was occupied in no time. I grabbed a seat near the front but toward the side of the stage, which happened to be right next to Jill Davison who runs PR for Amex Publishing. Jill was quite a good cheerleader, urging me to get up near the stage and take more photos. I must say I was a little intimidated by everything, so most of my photos from the first round are from a bit of a distance. Taking a cue from Iron Chef, the cook-off chefs were surprised with secret ingredients that were supposed to be incorporated into the dishes. The theme here was quite cute, using up leftovers from the other demonstration: pasta from Giada de Laurentis’s session, watermelon from José Andrés, fava beans from Suzanne Goin’s and some liver from, well, frankly I have no idea. Saturn rising signals the return of Chez Pim from an unscheduled disruption. I hope. The computer trouble will take yet another week or two to be completely sorted, but meanwhile I’m ready to return to regularly scheduled programming here! You’re wondering what this Saturn thing I’m talking about, aren’t you? Well, it’s the name of those cute peaches in the photo. These flat peaches have quite a few names: Ring of Saturn, Stark Saturn, and Peento among them. Have you seen them at your local farmers market? Over here in the Bay Area, they are at the height of the season. I’ve been buying them for the past couple of weeks from the Hamada Farm stand at the Ferry Plaza farmers market. They have a delicately sweet flavor with only a hint of acidity and a lovely perfume of white peach. Alain Passard uses sweet white peach in a summer salad with green almond and pea emulsion. 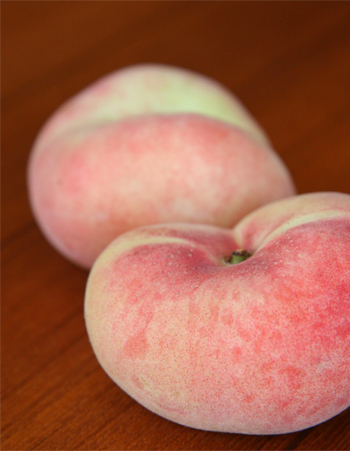 These Ring of Saturn peaches would make a more fun addition to that salad than the regular round white peaches. To make it, be sure to use light vinegar, like White Wine or Champagne, so as not to overwhelm the delicate peach. A little kiss of Acacia honey in the vinaigrette would be lovely too. And remember to add the thinly sliced pieces of peach at the end. Tossing will bruise them too much. See you tomorrow with the write-up from the Cook-off show down between Top Chef Harold and the beloved Jacques Pepin. ...sorry for the silence. I've been sick and by the time I got over it my computer died. Yes, two days ago it died again. It's getting to be annoying isn't it? I should just get a new one instead of trying for another fix, huh? Well, either way I'll get it sorted today, and will catch up on blogging and emailing and comment-answering(!) tomorrow. Thanks for the patience. Oh, yes, allez les bleus! !